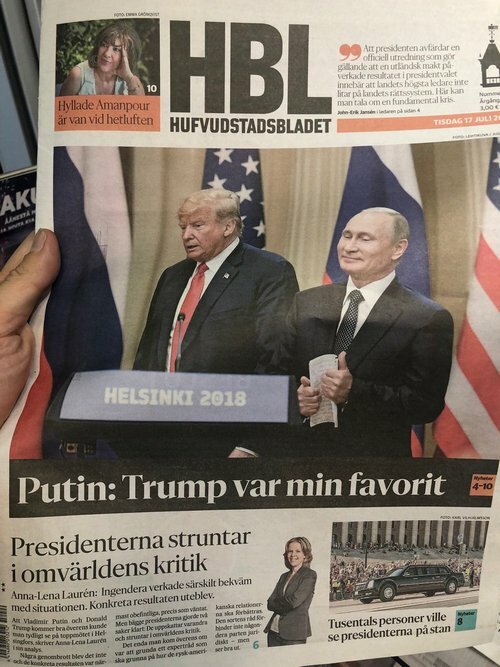 Newspapers around the world have reacted to Donald Trump and Vladimir Putin’s performances at the Helsinki summit, and are united in their assessment of which world leader came out on top. In the US, several papers went in hard on Trump. The New York Daily News accused the president of treason. Its front page featured an illustration of Trump holding hands with a bare-chested Putin and shooting Uncle Sam in the head with a gun in the other hand. The Washington Post’s headline is: “Trump touts Putin’s ‘powerful’ denial”. The paper says Trump handed the Russian president “an unalloyed diplomatic triumph” during their summit as he refused to support the “collective conclusion” of the US intelligence agencies that Russia interfered in the 2016 presidential election. 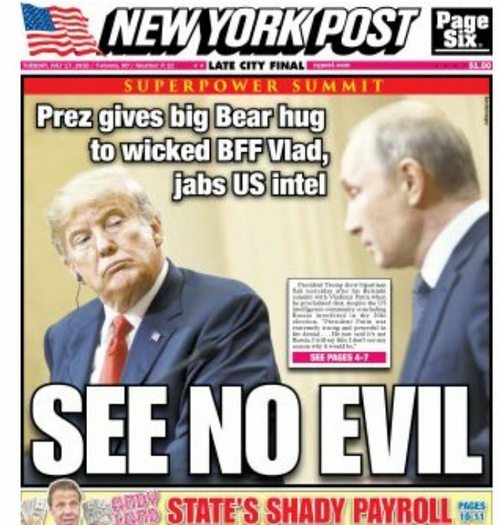 The New York Post ran with the headline: “See no evil”. In Russia, the government-owned daily, Rossiyskaya Gazeta, had a slightly different take. The paper said that relations with America had improved and that friends should not be fighting with friends. The paper reported that as a result of the discussions between the two leaders many things had changed for the better. 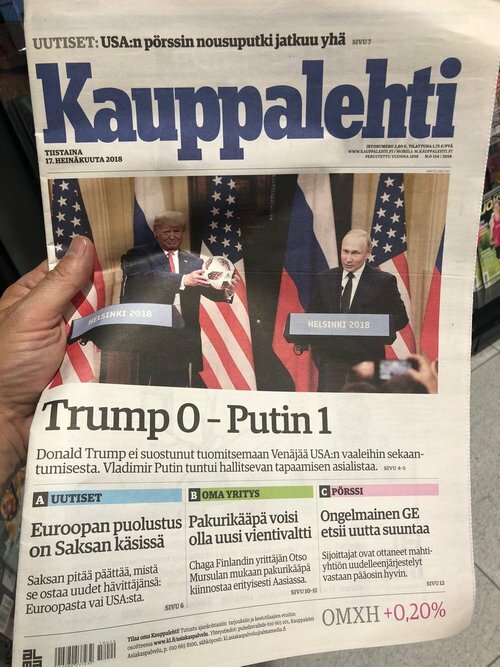 In Finland, the paper Kauppalehti made no bones about who had triumped at the summit: Trump 0 – Putin 1, was its front page headline. In the UK, the Guardian splashed on a picture of Trump and Putin’s Helsinki handshake with the headline “Nothing short of treasonous: Trump accused over Putin talks”. The Times said Trump faced a backlash after his “productive” summit with Putin. The left-leaning tabloid the Daily Mirror said: “Trump branded a traitor” with the main headline calling him “Putin’s poodle” after he backed the Russian leader’s denial of meddling in the US election. Britain’s right-wing Daily Express carried a double-page spread on the summit: “A nod and a wink … and the Cold War ends” is its headline, as Putin meets his “new best buddy”.